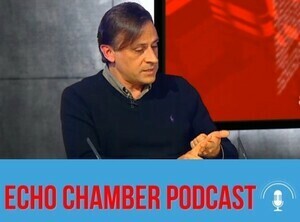 A special edition of the Tweet-based podcast as Tony Groves interviews economist Constantin Gurdgiev in a car travelling to last weekend’s Kilkenomics festival in Kilkenny. Constantin offers his insights into the relationship between mainstream and social media, the difference between RTÉ and BBC and what we didn’t learn from the financial crisis. Posted in Misc and tagged Constantin Gurdgiev, The Echo Chamber at 1:53 pm on November 14, 2017 by Bodger. There is a simple matter of arithmetic. Recall that the current Government came into power at the end of 1Q 2011. Let us suppose the Government really got down to ‘creating jobs’ by 1Q 2012. Which means the Government has been at its jobs game for roughly 14-15 quarters through 3Q 2015 or, at the lower end 3 years and a half. That means that the Government should have created “over” 182,000 jobs in that period. This benign to the Minister claim, because if we are to look at the record of the entire duration of the Government, his claim would have equated to roughly 221,000 jobs created. … Keep the two numbers in your mind: we are told that the Government has ‘created’ either more than 182,000 or more than 221,000 jobs over its tenure, depending on where one starts to count. Now, consult CSO QNHS database – the source of official counts for numbers in employment. Between the end of 1Q 2012 and 3Q 2015 (the latest for which we have data), total employment rose 158,000. But wait, these are not all jobs. 4,500 of that increase is in the category of Assisting Relative. And 121,200 of these additions are employees, including schemes. Beyond this, the above increase also includes 30,100 new (added) self-employed with no employees. It is hard to assume that the Government can claim it ‘created’ self-employment jobs where there is not enough activity to hire staff, or that it increased the need to help relatives. Numbers speak for themselves. By the very best metric, Government is more than 1/2 year shy of the lowest end of the claim of ‘more than 1,000 jobs created per week’. It is more than 1/2 year shy of the claim that there were ‘1,000 jobs created per week’. Posted in Misc and tagged Constantin Gurdgiev, Ireland, jobs at 12:21 pm on January 27, 2016 by Broadsheet. 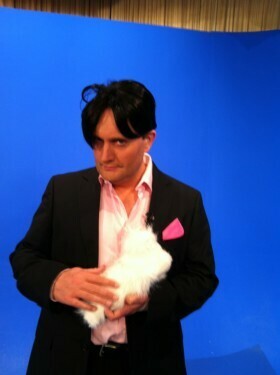 Posted in Misc and tagged Constantin Gurdgiev at 5:34 pm on May 28, 2012 by Broadsheet. 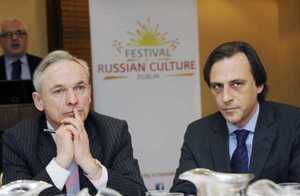 Richard Bruton with economist (and chairman of the Ireland Russia Business Association) Constantin Gurdgiev at a breakfast briefing on Russia this morning, part of the Dublin Festival of Russian Culture 2012. 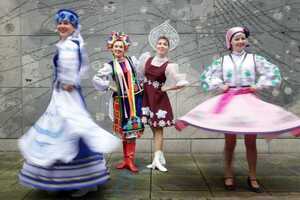 Natallia Kabiak from Rathmines wearing traditional Belarus dress, Inna Tykhovod from Lucan wearing traditional Ukrainian dress, Inna Karimova from Balbriggan wearing traditional Russian dress and Galyna Dubey from Tyrrelstown wearing Moldavian traditional dress. The week long festivities culminate in a family day on Sunday February 26th (traditionally celebrated in Russia as Maslenitsa or Pancake Day), where entertainment will take place in and around Cow’s Lane and Essex Street, Temple Bar. The centrepiece concert of the festival at the Olympia Theatre, featuring renowned Russian performer Oleg Pogudin, also takes place on Sunday at 2:30pm and 5pm. Posted in Misc and tagged Constantin Gurdgiev at 12:19 pm on February 24, 2012 by Broadsheet.